O.k. Now everyone extend an incriminating finger towards their monitors, and repeat after me… “Ha, ha, ha!” What are you laughing at? I stand by my yardage estimates and my advice to date. However I did neglect one tiny little thing. Checking to make sure that the quantity of yarn I had on hand was in fact correct. I had forgotten that I had already dipped into mint green for one of my fish hats. 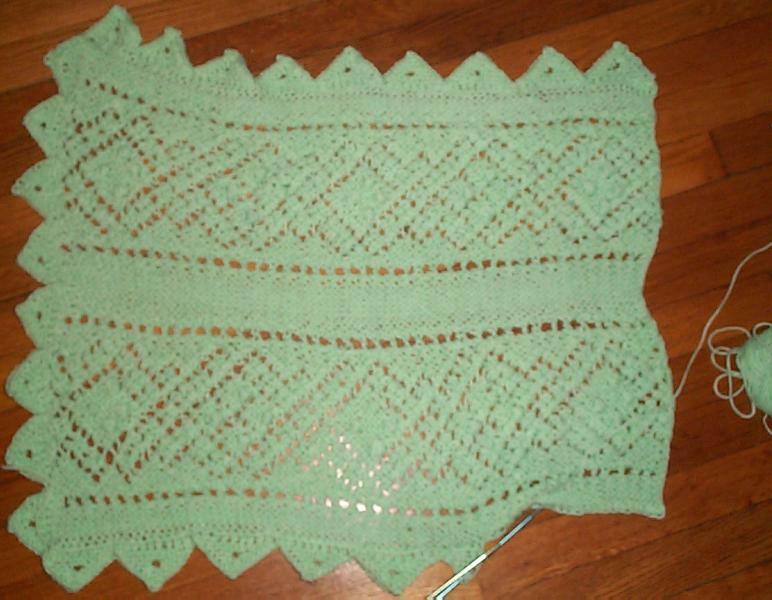 Had I not done so, I would have had enough of that yarn to finish out my planned triangle edging. But sadly, that was not to be. With about a quarter of the edging left to go, it was painfully clear that was going to come up short. What’s a knitter to do? How to do it? Very simple. I grabbed a pair of DPNS one size LARGER than the needles I used to work the body. In my case that means a US #9. Starting with the final loop left over after binding off the cast-off edge and NOT breaking the yarn, I cast on three new stitches using a half hitch cast-on. I now had four stitches on my needle, including the initial loop. I knit back across these four, to end up at the edge of my work. Then I picked up one stitch in the first selvage chain immediately to the left of that initial bind off loop, for a total of five stitches on my needle. That means I’ll be working counterclockwise around the edge of my blanket. Following standard I-cord process, without flipping the work over, shoved the stitches back up to business end of my left hand needle, stranded tightly across the back and commenced knitting the same four stitches from the “away” edge again, working from there back towards the point of attachment. On this row I knit 3, then did a SSK and picked up one stitch in the next available selvage chain point. I continued work in this manner on every row with one VERY IMPORTANT EXCEPTION. After every fourth row, I concluded row number 5 by picking up one stitch in the same edge chain as row number 4. Were I not to do this, my blanket would be gathered into an edging that was less elastic and with fewer stitches per inch than are in the body. Think old fashioned dirndl apron, with the full skirt gathered into a tight waist tie. While this would be a very useful effect on another project, it would not be an advantage on our blanket, which we would prefer to lie flat rather than be gathered around the edge like a rectangular mushroom cap. I’ll have more than enough yarn to finish out my last remaining side of I-cord. Problem avoided. So the dual morals of my story are: 1) Trust but verify. Especially yardage; and 2) Be flexible. If you’re going to knit in the “flying blind” style I describe for this project, always have an fall back plan in reserve, just in case things don’t quite work out perfectly, and always be prepared to laugh at yourself (in my case, with an Internet chorus), rip back and re-knit. Continue with the chart as presented. 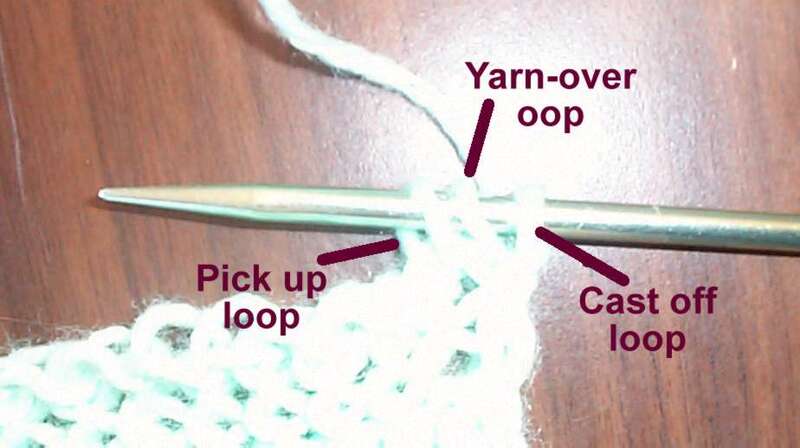 Each side should begin and end with row 1, if necessary fudge a stitch here or there, either skipping an edge chain or working two rows into the same chain to achieve that result. The best place for fudging is on row 1, so if you are getting close to the end, count out the remaining stitches and make any adjustments between triangles as you close in on the corner rather than waiting to the very end and trying to fix things in the last couple of stitches. So there you have it. 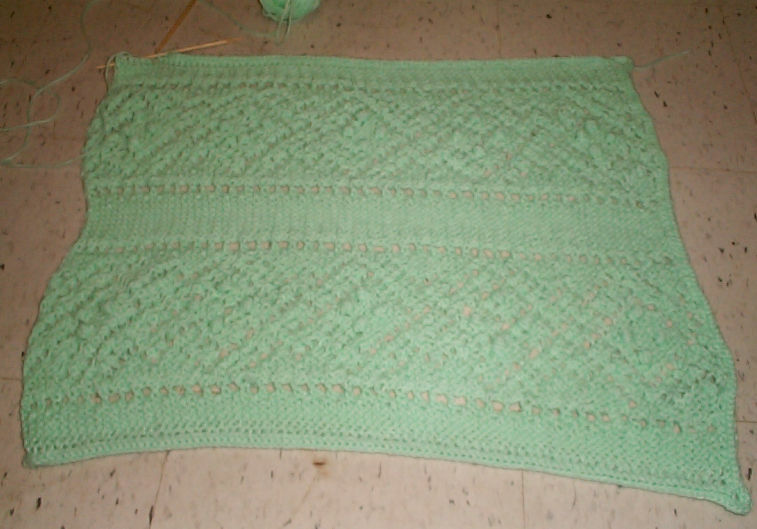 An off-the-cuff simple small basket-sized blanket. Complete with running out of yarn – the worst possible error such a project could entail, and a similarly improvised problem mitigation strategy. You can stop laughing now. If you’ve got questions on any aspect of this project, please feel free to post them or send them to me. I’ll try to answer all in the next post. How do you do the corners with I-cord?